making the city a slightly nicer place to be. Hi. My name is James Murphy, and i'm a musician and long time NYC subway rider. I've been trying for 15 years to find a way to make a very simple project for the subway system come together, and now, with the imminent change announced by the MTA from the MetroCard to a tap and ride system, i feel the time is right to get some help with my little idea. I love the subway system of my city--one of the most egalitarian, kind and high-functioning miracles in a city known around the world for it's nearly unforgiving toughness. I also love sound, and music. Unfortunately, the sound of the subway is kind of a drag. 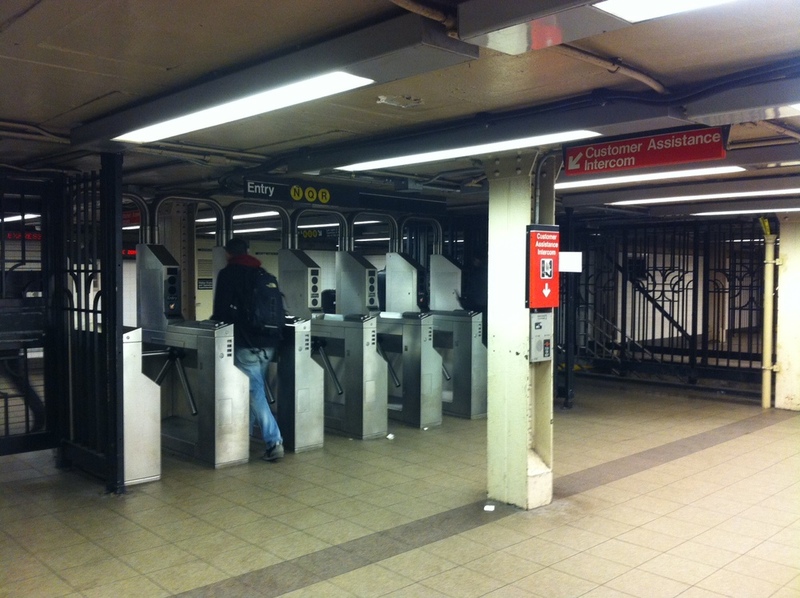 Every time you swipe your MetroCard, the turnstile emits a flat, unpleasant "beep". Each turnstile emits its own beep, all of which are slightly out of tune with one another, creating a dissonant rubbing-styrofoam-on-glass squeak in stations all around New York City. It's kind of horrible. "This is not a big deal!" you cry. "There are way bigger problems in New York!" you yell. You're pretty much totally right. But this one is so infuriating because, quite simply, it would be really cheap and easy to change. And I think it would be really lovely, honestly. What i propose to do is to create a series of 3 to 5 note sequences, all unique, one for each station in the subway system. These sequences will be part of an intersecting larger piece of music, which would run from station to station, and cross one another as, say, the 4, 5, 6 line (one musical piece) intersects with the L, N, R, Q and W (another musical piece) at Union Square. At each turnstile in Union Square, as you tap your new tap and ride card, a pleasant bell tone will sound, in one of a set of possible notes, all related to that station's note sequence. The effect would be that at the busiest times, like rush hour, what was once cacophony would now be music. I believe that music makes people happy, and makes them reflective. I think people who are willing to do what it takes to live here and work here--the commutes and the crowds, deserve a small sonic gift on their way home, or to deliver something, or getting to their school in another neighborhood. And i think that in the years to come, if this system is implemented, people who grew up with these sounds will hear a piece of music at an opera, or on an ad, or in the background of a film and feel a nostalgia for their first apartment, or their basketball practices, as they think "this song reminds me of Borough Hall" or "This song reminds me of my school be East Broadway". I think people reading a magazine will hear their little melody before the station's name is announced and know they're home, even when their language brain is completely engrossed in an interview. I believe that a musician making beats for a rapper from a particular neighborhood will use the melody of the station near their home as the hook for a song, and that every kid from that particular neighborhood will instantly know that this song is about where they're from. It's financially and technically a pretty simple project, but over the past long while i've found that this doesn't mean it will be easy to make happen. The city has big things to deal with, and the MTA is busy getting me an millions of other New Yorkers to work and school every day. Still, someone's going to make a chip that beeps on the next system… that's a given. All I'm asking for is the chance to help make that beep something memorable. Please help me make our city just a little more kind.